Only 32 years have passed since this fantastic official poster for the 1976 Montreal Olympics was produced, but from a 2008 vantage point it’s hard to imagine how a committee ever okayed it. Whoever they were, they were in Montreal, it was 1976, and things were a lot groovier than they are now. See here. With the Vancouver 2010 Winter Olympics coming up and with the athletes’ village not that far away from my Chinatown studio, it’s getting hard to ignore the sad new state of official Olympic design. The phrase “corporate clip art” comes to mind with every new design the Vancouver Olympic committee puts out, and that seems to be an Olympic trend. Some of it looks distinctly like it might be selling feminine hygiene products. 1960s and 70s design—graphic as well as interior and architectural—seems more fearless, open, uncluttered and somehow international in its outlook. The Montreal designs had all of these virtues. It’s just inconceivable to imagine the bold, edgy and yet friendly poster above being sanctioned by any Olympic Committee in these newly staid and oddly style-less times. Vancouver won’t even be getting adequate graphic design, let alone anything as deft as the numerous instant classics that Montreal managed to produce—see below. Also see the Canadian Design Resource on the topic of what has happened to Olympic design in general. 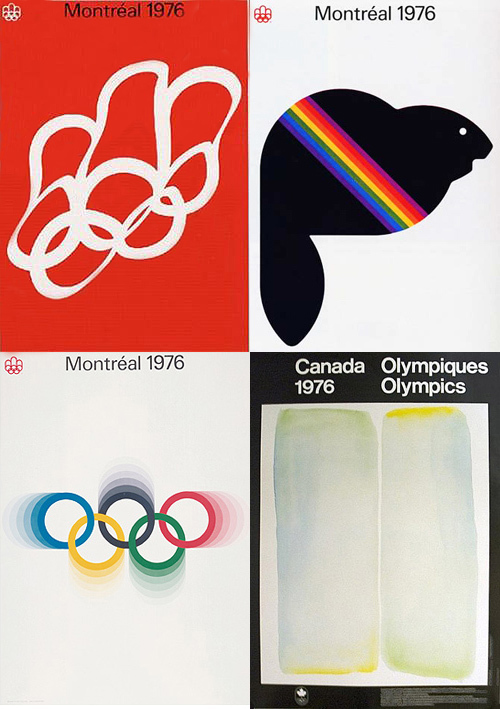 I particularly like the fact that in 1976 the Canadian government issued well-designed official Olympic posters showcasing then-current contemporary art (bottom right). Can you imagine that happening now? My favourite of the 1976 posters below, though, is the wavy white Olympic logo on red connoting the waves in water sports. Beautiful and simple—and so is the beaver “Amik” mascot. Nostalgia may be a weakness, but if design were better who would need to indulge in it? And it’s all too easy to shut down discussion by calling a liking for good design nostalgia when it’s not. The fact is, the 1970s were a golden age of graphic design. We are trailing; it’s a fact. Thanks to Michel Lamoureux (see comments section) for interesting information on the design group who produced this work! This entry was posted on Tuesday, November 18th, 2008 at 5:36 pm	and is filed under British Columbia, Canadian design, design, graphics and signage, politics, Vancouver. You can follow any responses to this entry through the RSS 2.0 feed. You can leave a response, or trackback from your own site. 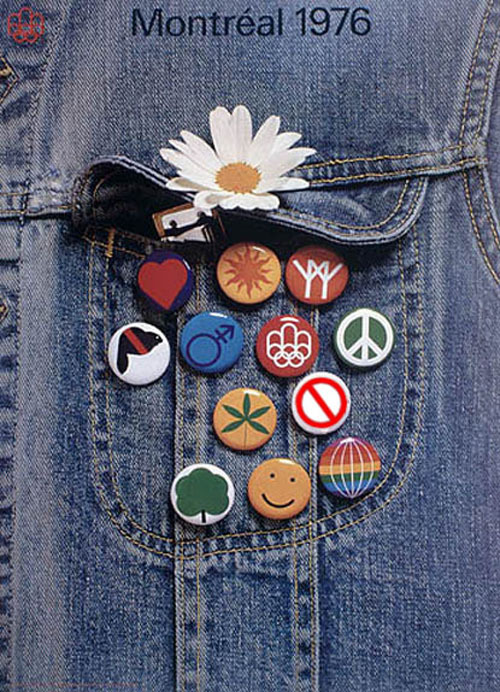 The intent of this official thematic poster was to symbolize the YOUTH getting together to celebrate the 1976 Olympics. It had nothing to do with the political aspect of the event. Having worked in the production of all the 8 thematic official posters, all I can say is that each one was done to visualize the spirit of the subjects chosen. Had nothing to do with marketing or politics. Michel, can you say more about the design of the posters? Also, I would add that I am using politics with a small c. Maybe you had to be in Vancouver for the leadup to our Olympics but I can tell you that there was no sop to the youth here for our Olympics, and marijuana and Vancouver and its youth are certainly an aspect of local culture. Anything remotely close to something sort of cheeky (and illegal! as it was in ’76) as a nod to youth or alternative culture, the way the Montreal posters seem to pull off, was absolutely excised from our Olympics. Politics was too, of the kind that can be subtly embedded in design. Maybe one only notices something when it’s lacking. I can tell you though that peace signs or the 2010 equivalent were utterly missing from anything official to do with the Olympics – certainly anything that emanated from Olympics bodies or any level of gov’t – BC, Vancouver City Hall, or the feds. What was got was a pretty sanitized PR package. And as I said in my post, not very good design either. Compared to the staff hired for the Munich Olympics we were a very small number of staff. I for one, was alone to prepare all the technical information and doing the coordinating from creative to final delivery of every item produced thru printing and banners, compared to 5 people doing the same amount and number of works done in Munich. Each poster was given to a different graphic designer with guidelines, working on commission outside the Graphic Design Unit. Generally there was so little time available between the basic information being available and the time the items were required to answer the International Olympic Committee meetings. So everything had to be completed in a very short period. Copy, photographs, plans and graphics had to be put together within one week and the printing done and delivered the next week. In those days we didn’t have computers to gather all that information in a printing format. The typesetting, mounting, color separations, plate-making all had to be done by hand. On a budget of 2.5 million dollars, we managed to do the whole work at 1.5 million dollars. The remaining 1 million dollars was split as a bonus to the Board of Directors. This Graphic Design Department was the only one that did not exceed its budget. There was no knowledge of this published anywhere. After 40 years since, it still is a hard fact to swallow. Our one and only purpose was to have the world know that as Canadians, we could not only do the job, but made sure, we gave it the best quality in all the trades involved. It’s almost inconceivable by today’s standards. Do you think that in a way the time and material constraints contributed to the beauty and simplicity of that work? Thanks for this inside history! Fascinating. Michel, I have another question too. The same summer as the Olympics, the major UN Habitat conference was being held in Vancouver (I’m just completing a book on Habitat). The graphics for that, which were done by Graham Hughes and Frank Mayrs & co. from Information Canada, must have been done at the same time. How was your group constituted and were some of you part of the Information Canada crowd? Was your Graphic Design Department part of the Montreal or Quebec governments? As for the fact that you guys didn’t the credit or the bonuses – that is pretty hard to swallow. Have you thought about writing a book or at least article on this? 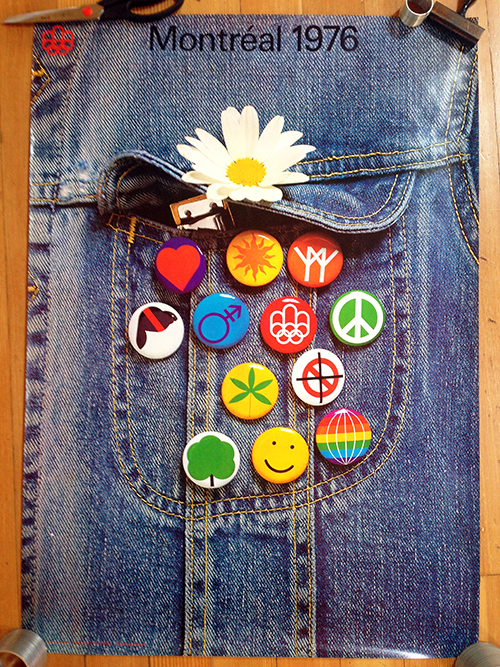 PS Michel do you remember who designed that particular poster, the buttons on denim? And which ones did you design? I have long liked all of them. There was also a series of posters of modern Canadian/Quebec painting (one is pictured at bottom right in my post) – was that your group too? Our Department “Graphism and design” was part of “The Organizing Committee of the 1976 Olympic Games”. It was an independant organisation from all governments. If you were to look at the Official Report of the Montreal Olympic Games of which I have a French copy but is available in English also. you will see what work was done by the people that were permanent staff, only 10, out of that listing which contained names of people that worked only once on a specific project. All those 10 people were selected because of their prior experience and knowledge to fill the needs required to achieve what had to be done. I did not design any poster or work in the creative side of what was done. I wrote all the technical information and did the coordinating from creative and printing to final delivery of every item produced thru printing and banners. My responsibility was to reach the best quality from all suppliers. The only posters that were produced by our group are shown in the Official Report, pages 314 thru 361. It also shows our involvement in other aspects for the events. I’ll look for this report. Has anyone seen one in second-hand anywhere? And I’ll edit the post to put Raymond Bellemare’s name in! Looking at all that is happening with government projects in all kinds of domains today, it wouldn’t be worth the time to write or be read. As no one would believe that something like that happened. As a matter of fact, the management of the Organizing Olympic Committee, even had people from outside brought in to study if we were sufficiently capable of achieving what required to be done. That’s precisely why I would find that book interesting. About the poster, after having spoken with Raymond Bellemare, he indicated to me that the second button on the 3 rd row, showing a forbidden red symbol had been modified as originally, there was a light black cross over it, which was removed, meaning that forbidding was not authorized. So the poster you are showing is a counterfeit. Michel: That is fascinating. I am now not certain where I got this photo. I wonder if there is a correct, official version of the poster around? Could this have been an early, rejected version? And of course I’ve never actually seen a button with just a red slash through nothing before – I always wondered what that was supposed to mean. For that matter I don’t know what that black plus sign is meant to mean either! Michel, I see what you mean. I actually found a photo of the official poster as you describe and have added it to the blog post. And I bought one of the posters on eBay – I found it while searching for the one you described! The photo I added is from the poster listing. I see there’s another one for sale in the states for far more than I paid – US $300! Where can they be reached at $300 US, I am curious to see what is being offered. Michel, my poster arrived! And it’s fantastic! I’m going to frame it. I’m uploading a picture of it to the blog post. The poster shown here is not the official poster in its integrity. 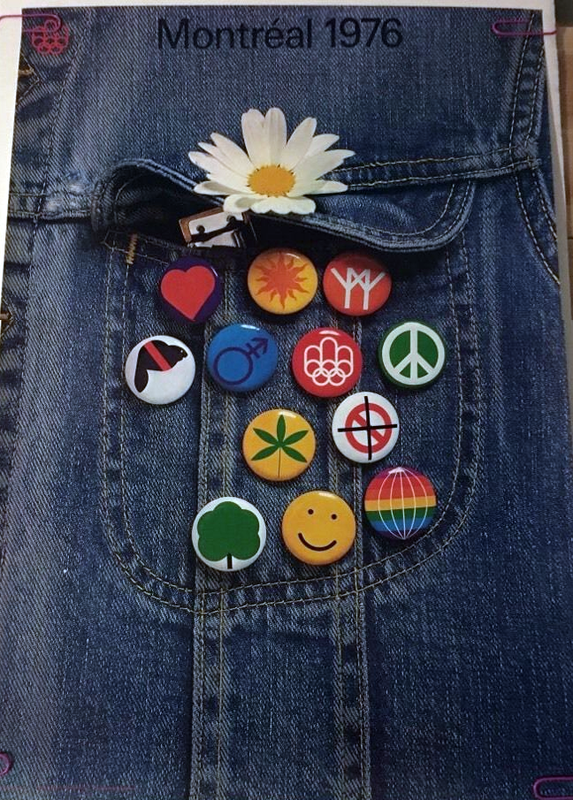 One of the 12 buttons (9th from left to right and from top to bottom) which symbolize forbidden action in any ways has been modified. A black mark over the red circle with a ban stroke has disappeared. The meaning of this black mark over the circle render void the red circle symbol. For youth, this means no ban on anything at all. If you want to compare the poster shown here with the original I can email you the real thing. Hi Michel, I’m curious about the black-bordered poster with the painting on it. Do you know the names of the artwork and artist? I tried searching for info and it looks like it was part of a series of posters showcasing Canadian artists. The series of posters showcasing Canadian artists was most likely sponsored by the Canadian government or an association of artists. They were not part of the Montreal Organizing Olympic Committee. Look up Canadian Artist organizations to get more information. they should be able to inform you on that.